HealthWizard is a suite of four seamlessly integrated software programs used by health professionals to measure and track their client’s fitness and wellness status. Fitness Profile: measure physical parameters like body weight, body fat, blood pressure, strength, and cardiovascular fitness. Wellness Profile: analyze lifestyle behaviors in the areas of exercise, nutrition, smoking, safety, and stress. Health History: collect health status information and determine readiness for increased exercise activity. MicroFit Manager: marketing and productivity features to help you run a more profitable and efficient wellness program. 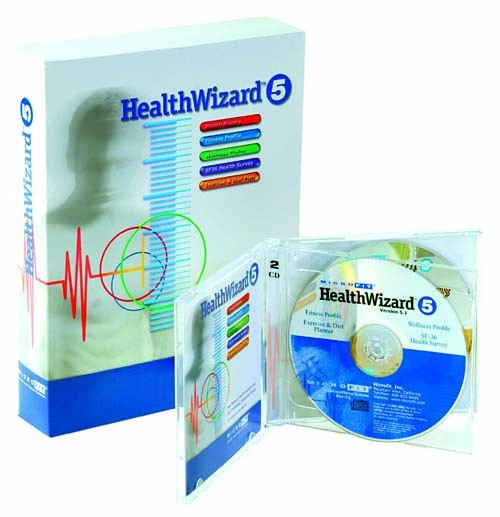 HealthWizard is a PC desktop application compatible with Windows XP/7/10. You can also use HealthWizard on a Mac that has been set up to run Windows. HealthWizard is sold with a lifetime license, per computer, for a one time fee. HealthWizard is available in two versions offering a choice of features and price. HealthWizard Pro is designed for organizations that may want to set up multiple testing stations, print group reports, customize reports, or use the integrated MicroFit FAS-2 assessment equipment, RoboBike, or MF1215 Treadmill. HealthWizard Lite is designed for small fitness facilities and personal trainers who have a limited budget, only need a basic reporting tool for individual clients, and have their own assessment equipment. Visit each software program page to learn more about the feature differences between the HealthWizard Pro and HealthWizard Lite.